The phenomenal charge of the Porsche 911 GT3 R fielded by KÜS Team75 Bernhard on Sunday was almost rewarded with a podium result. 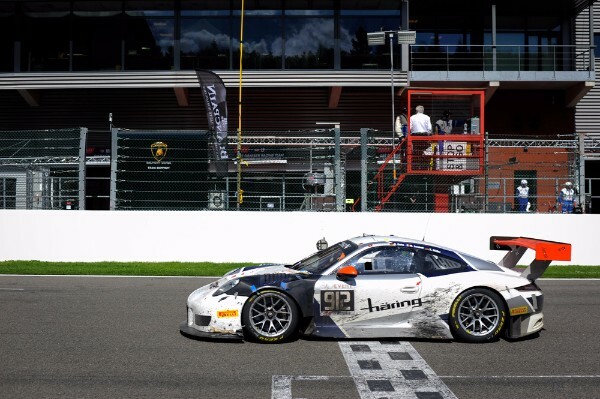 At the long-distance marathon in Spa-Francorchamps, the 500 hp 911 with the starting number 117 narrowly missed out on claiming a podium spot and secured a commendable fourth place in a strong field of 63 vehicles from eleven manufacturers. Until then, Michael Christensen (Denmark) and his teammates Kévin Estre (France) and Laurens Vanthoor (Belgium) fought their way back to the top from an almost hopeless situation. After receiving a time penalty, the Porsche 911 GT3 R lost two-and-a-half laps on Saturday but, with a perfect race strategy and fast stints, it was able to plough through the field. At one point, KÜS Team75 Bernhard’s 911 even took the lead. After being handed another penalty, the team was unable to make up for the time that was lost. The two Porsche 911 GT3 R campaigned by Herberth Motorsport on the storied 7.004-kilometre racetrack were also hampered by drive-through penalties and other competitor’s accidents. At the wheel of the #912 vehicle, Porsche Young Professional Mathieu Jaminet (France), Sven Müller and Ralf Bohn (both Germany) as well as Daniel Allemann (Switzerland) took up the race from second in the Pro-Am category, but after many long stops in the pits for repairs, were not able to progress beyond seventh place. Herberth Motorsport’s second vehicle did not survive the night. The #911 Porsche 911 GT3 R encountered debris on the track and was so badly damaged that repairs were no longer possible. After 138 laps, the race for the all-German driver quartet Marc Lieb, Alfred and Robert Renauer as well as Jürgen Häring was over. This means position 17 in the Pro-Am category.